Are you dreaming of a custom garage, garage workshop, garage apartment, storage space, home office, man cave, or in-law suite for your Raleigh, NC-area home? At Home Work Services (HWS) Garages, we can bring your dreams to reality at a price that fits well within your budget. Contact HWS Garages today by completing the form to the right to request a free, no-obligation estimate on a new custom garage. Located in Wake Forest, NC, just north of Rolesville, our garage models are open from daylight to dark, so drop by to check them out. For extra cost savings, view our latest offers and custom garage specials. Don’t forget! We have financing available! HWS Garages specializes in attached and detached garages, offering a range of standard and custom garages with virtually endless possibilities for personalization. We take great pride in meeting the needs of our clients, whether building a pool house, man cave, workshop space, single, 2-car or 3-car garage, garage apartment, or almost any other custom option. Our one-story attached and detached custom garages are designed to match your home and built with lasting quality. We construct a full range of 2-story garages with lofts, apartments, workshops, storage space, man caves, and more. Specializing in custom detached garages, HWS Garages is capable of bringing your dream garage to a quality reality. We build quality attached 1-story and 2-story garages that are carefully matched to your home’s roofing and siding. At HWS Garages, the custom garages we build are a cut above, and we have an A+ rating with the Better Business Bureau. Check out our photo gallery to see pictures of our custom garages and discover our capabilities. HWS Garages Fall and Winter Special: receive a $200 discount on any electrical installation over $2,000! HWS Garages is a custom garage builder offering 1-story and 2-story attached and detached garages to homeowners in Raleigh, Cary, Durham, Wake Forest, Fuquay-Varina, Apex, Clayton, Smithfield, Sanford, Chapel Hill, and in locations throughout the NC Triangle area. 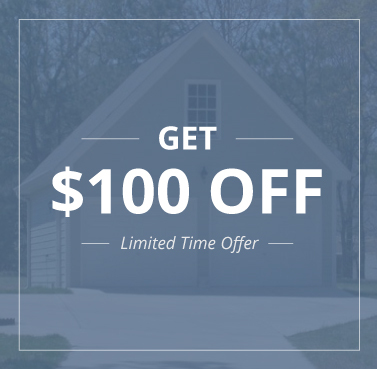 Right now with HWS Garages, receive a $100 discount towards a signed contract when stopping by the office to start your garage building project. While you’re here you can view our recently built garages and receive a free consultation from our garage building experts. Call 919-562-8313 to schedule your appointment! Call 919-562-8313 to schedule your appointment!